Fiona McCarthy is ACCF’s CerviCan Support Coordinator. 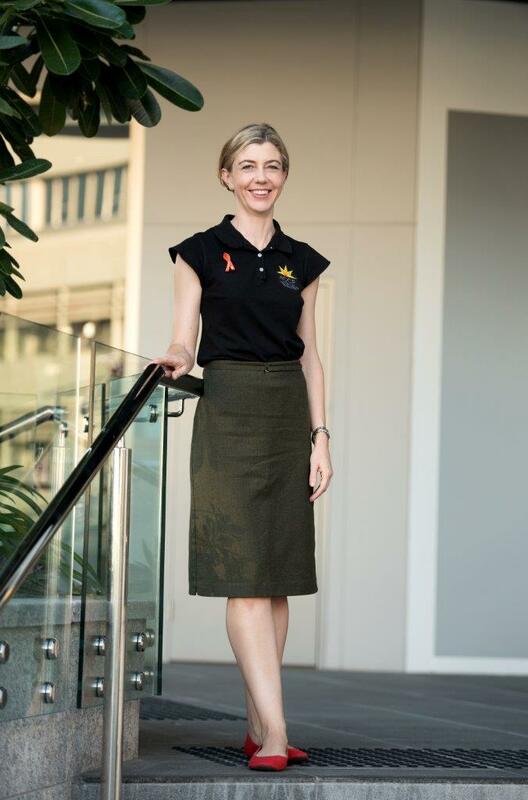 With over 900 women diagnosed with cervical cancer each year in Australia, Fiona is often the first point of contact for these women after their diagnosis. Fiona offers support, information and resources to help these women and their families at this stressful and scary time. Get in touch by clicking here and filling in our “send enquiry” form. ACCF is proud to be a partner of CancerAid who work to empower cancer patients and their caregivers by providing a unique cancer management and support application. Available on iPhone and Android, tools varying from diagnosis information from your doctor, to a personal journal are accessible to the user. Read more here. Cancer Council Online Community is a free, professionally moderated online support community where people living with and affected by cancer can find, receive and provide support by participating in groups, discussions, blogs and webinars. You can join the forums here. Healthshare is an online support community that enables you to connect and share with other people around Australia. By joining the Australian Cervical Cancer Foundation’s Healthshare Community, you will be able to ask questions, share your personal experience, find support within the community, and access high quality information about cervical cancer. Click here for more information about Healthshare, visit their cervical cancer page, and have a look at ACCF’s community for further information and to connect with people who know what you are going through. This Facebook page has been created to provide an active, supportive group of women made up of over 600 members from Australia and New Zealand who have, or have had Cervical Cancer, or other gynaecological cancer, issues. The page offers women a place to come together for support, understanding, love, humour, and above all friendship. Also open to carers, family and your support network. If you would like to join this group please follow this link https://www.facebook.com/groups/644503988935517 and submit your request to join. Counterpart is an information and support service for Victorian women living with breast or gynaecological cancers, including cervical cancer. They provide a range of information and support services through their city based Resource Centre, digital and outreach projects. They support women with cancer to live well, along with their family and friends. Counterpart offers women a holistic, women-centred, community based service that works in tandem with their medical systems and existing support systems. They offer a confidential, free service. Counterpart is a service of Women’s Health Victoria and is supported by the Victorian Department of Health and Human Services. NB: Women living outside of Victoria can still register for any Counterpart webinars that are of interest to them. They provide information about all aspects of cancer to cancer patients and the general community, through Cancer Council 13 11 20. Look Good Feel Better for women is a free community service program that provides useful information and tips specifically tailored to help women deal with the appearance-related side effects of cancer treatment. Home-delivered Confidence-Kits are a supplementary service developed to assist cancer patients who are unable to attend a Look Good Feel Better workshop for health, travel or personal reasons. Visit their website here. The Work after Cancer website is a resource to support work during and after cancer diagnosis, providing advice to people diagnosed with cancer, their loved ones, clinicians and employers about their options, rights and responsibilities. This website also offers information relating to financial assistance for people diagnosed with cancer and their families. Mummy’s wish aims to support Australian families with children aged 12 years and under, through the provision of immediate and non-means tested support whilst mum is receiving treatment for cancer. They can give you a call to chat through advice on how to juggle cancer treatment and family commitment, help with housework and many other practical tasks. Contact them here. CanTeen supports those aged 12-25 whose world has been turned upside down by cancer, including those with a parent who has cancer. For more information click here.